Courtesy photo Wood River Middle School seventh-grade Blue Team student bowls will be available for purchase on Friday, Dec. 17, from 8:30-10:15 a.m. in the Middle School foyer. All proceeds will benefit the Hunger Coalition. Students at Wood River Middle School have been learning how to make a difference locally and globally, which culminated in the creation of ceramic bowls that the students designed and painted to sell to support the Hunger Coalition. Teachers Bruce Clark, Jill Clark, Sue Harley, Bridget Kapala, Donna McKelvey and Julie Nelson presented a unit to the students that involved all their core subject areas. It started with a motivating video about world hunger in science class, where students learned about sustainability. Using www.freerice.com, students played online learning activities to earn grains of rice that the program donates to the United Nations food bank. In social studies class, students learned about symbolism in different cultures and used that knowledge to help design bowls. They also learned about circumference and ratio of the ceramic bowls in math class, where they measured their design strips for the bowl. The theme for the students' design involved the Blue Team's unit questions, Who am I? and Who am I becoming? Students explored their questions through literature and poetry, writing in their language arts classes. Blue Team seventh-graders' unit project will conclude with an art walk gallery to exhibit their ceramic bowls. 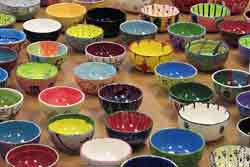 Bowls will be available for purchase on Friday, Dec. 17, from 8:30-10:15 a.m. in the Middle School foyer. Due to a generous contribution from the Blaine County Education Foundation and student donations for materials, all proceeds from the gallery walk will be donated to the Hunger Coalition. Students are asking for a $15 minimum donation for the bowls. A slideshow of the project is available at www.blaineschools.org/Schools/WRMS.